WHY ONE FITNESS CREW HAS BEEN MAKING SHAPES ALL OVER DONEGAL AND BEYOND! The members of one Donegal gym community have been in a hot competition this summer to win a €1,000 holiday – and the winner is due to be revealed this weekend. You may have noticed people doing peculiar poses around famous Donegal sites or tagging #summershapeup on Facebook over the last 8 weeks, and it was all down to Rushe Fitness. The Summer Shape Up Challenge was an 8 week fitness challenge created by Emmet Rushe at Rushe Fitness. The personal trainer from Lifford wanted to create a summer challenge for his members that was about more than simply training in the gym. As an added incentive to keep his members motivated over the summer months, Emmet offered a €1000 holiday to the winner. Over 200 members jumped on the challenge with such enthusiasm and determination , that what started out as a challenge, turned into a great summer craze. The weekly challenges have inspired the Rushe Fitness members to travel all over Donegal (and further afield!) to see who could complete their challenge in the most original location or in the most original way. The result? Hundreds of photographs of the members doing planks, handstands and pull-ups in the most beautiful parts of our county. As the weeks progressed, the challenges became more complicated, often requiring groups of people to complete them. While many of the members joined up during the fitness classes in Emmet’s gym, others got their families and friends involved. Some even had their children and dogs join in the fun. 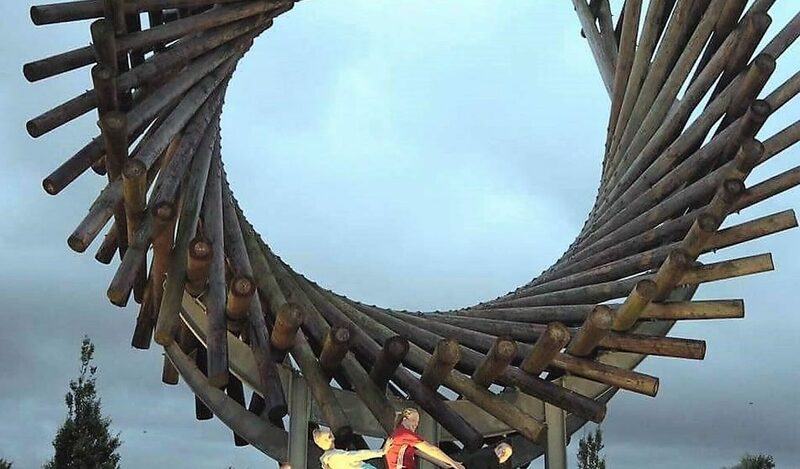 One of the most talked about has been the 6am crew who completed their fan challenge at the Polestar roundabout. The Bicycle videos have been seen by thousands in the past week, as much for their soundtracks as the visual! Emmet has even had photographs sent in from the Bolivian Salt Plains and by one of the members from her honeymoon in Bali. Emmet was determined to put the fun back into fitness during what is usually a quiet time in the fitness industry. As well as eating healthy and losing weight, the members have had fun. Emmet devised a point based challenge where members logged their food, exercise, extra activities and challenge pics using the hashtag #summershapeup. The challenge quickly became a team effort as momentum picked up and the competitive streaks became obvious, with many ideas for recent challenges being suggested by members themselves. “With the kids off school and holidays planned, many people use the summer as a time to take a break from their training. I wanted to create a plan that would allow my members to include their families and keep on track, even if they were away on holiday. The classes have been bursting all summer, but it’s not just been about the gym.” said Rushe Fitness founder Emmet. “We’ve had members checking in and completing challenge from Spain, Portugal and even from weddings. I’m delighted with how my members have embraced this challenge, many realising that fitness is not just about signing up to sessions of classes, it’s about lifestyle and consistency. “I love seeing the members doing the challenges with their families. We’ve really put the fun back into fitness this summer and the members have shown Donegal in all its glory. It’s been amazing,” Emmet said. The Summer Shape Up comes to a conclusion this Saturday, with the overall prize being presented in Backstage Bar and Grill at Century Letterkenny.